That was until this week. One company has restored my faith in customer service (temporarily, at least). Two weeks ago, I bought a George Foreman indoor/outdoor grill with a stand (for using the grill outdoors) at a yard sale. 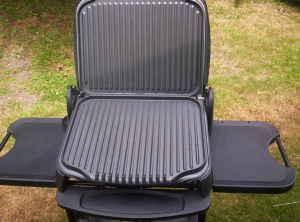 The grill is in fantastic shape, and the stand is in extremely good condition as well. However, after attempting to use it, I realized that there was nowhere to set the drip tray that’s supposed to catch the grease (you can see a photo of a grill and stand just like mine, with the drip tray holder that mine was missing). The first few times I used it, I just assumed that the manufacturer intended for you to just let the grease drip on the ground when you use the grill outdoors. Then, however, I started doing some searching online (actually, I was curious to see just how good of a deal I got at the yard sale) and eventually found a picture of the stand that came with my grill. Lo and behold, there is supposed to be a little tray that slips between the grill and the stand that you can set the drip tray on. After figuring out that little tidbit, I decided to see if I could get a replacement part for my grill stand. I searched a little more over the Internet and came across a few sites selling the grill as a “10042” and the stand as a “10043” (I assumed those were model numbers). With the model number (or, at least what I thought was the model number) in hand, I started searching the Internet one more time for replacement parts. After an unsuccessful search, I started over again simply searching for “Foreman grill replacement parts” and finally ended up at the Applica Consumer Affairs Web site. Apparently, Applica Consumer Affairs is a subsidiary of Salton, which is the manufacturer of the George Foreman grills (and, somehow, a company called Fox International figures into the equation, too). I searched the site and was not able to find any information about my grill, so I clicked on the link to contact the company. I fired off an e-mail asking for assistance. On Tuesday, when I got home, I was shocked to see a response in my inbox. The message I received informed me that the model numbers I provided did not match anything in their records. However, the message also included a comprehensive set of questions they needed me to answer in order to better assist me. On top of that, they also provided me with information on how to obtain the answers to each of those questions (like where to find the model number, etc.). I shot back a response with all of the answers I could provide (obviously I couldn’t provide the original date and price of purchase, as I wasn’t the original owner). This evening, I received yet another response providing me with the part number for the tray I need, along with a Web site I could peruse for that part and a phone number I could call if the part wasn’t listed on the Web site. Of course, the part wasn’t listed on the Web site, so I called the number and was greeted with a very friendly response after a very short hold time. The e-mail message says that their operating hours are 8:30 a.m. to 8 p.m. ET, and, by gosh, they were still there when I called at 7:45 p.m. The guy started the conversation by providing me with his name and his identification number, then asked for my phone number. Upon providing him with my phone number, he was able to very quickly pull up my e-mail trail from their system, and was able to help me out. The guy was extremely friendly, with a midwestern accent (I think he told me he’s in Cleveland), which, in itself was a pleasant surprise after dealing with people at companies like Sprint/Nextel and HP/Compaq, where they speak very quietly in broken English so that I can neither hear nor understand them. In the end, I found out that the replacement part will cost me $14.95 with shipping and handling, which isn’t unreasonable by any stretch of the imagination, but I will have to think about it, since that’s almost as much as I paid for the grill and the stand in the first place. Before I got off the phone, he told me that he would go ahead and send me a PDF version of the owner’s manual so that I would have it for future reference. A few minutes later, the manual showed up in my e-mail inbox. I just wanted to write a post about my positive customer service experience, and to let everyone know that there are still some companies that do provide customer support. If you are considering purchasing any household appliances, I hope you will consider the products that are supported by Applica Consumer Affairs (which apparently include George Foreman, Black and Decker, Hamilton Beach and many more).